About a month ago, the first time the temperature dipped below 80 since June, everyone here in New York started talking about Autumn. How it was coming, how it was almost here, how you could feel the cold snap in the air and I, for one, was annoyed. I don't like words like Autumn, Fall, or Cold Snap in August. Not even late August. In my opinion, until labor day, summer is still in full swing. And in summer I don't want to talk about cold snaps, I want to talk about swimming, and farmers markets, and trips to the beach. Everyone is far too eager to speed August along into Fall. Meanwhile, I want to shout Stop! Slow down! Don't forget that Winter is Coming! BRRRRR! I said the words Indian Summer to S too many times this year, as if by hoping I could will one into existence. But now it's mid-September, yesterday was the first actual day of Fall, the cold snap has settled in as a nice pleasant cool front, and I am ready to accept that it is Autumn. 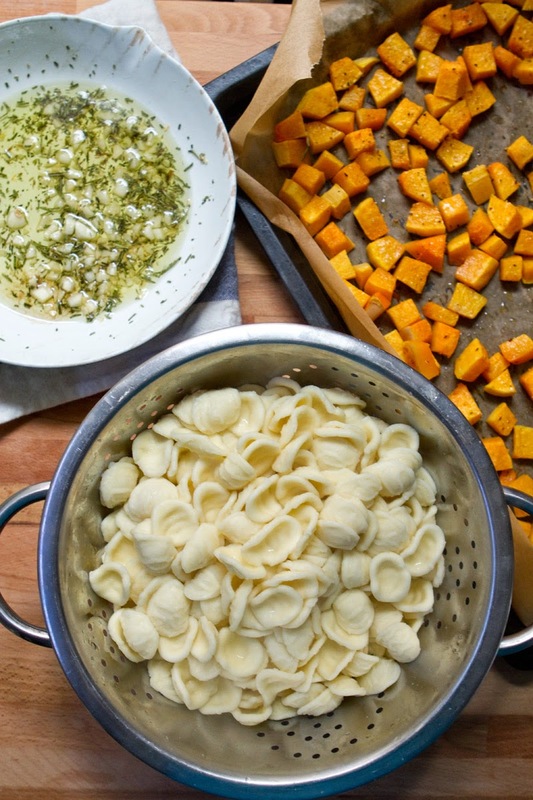 And Autumn calls for gourds, hearty foods, and cheese. This pasta has all three. 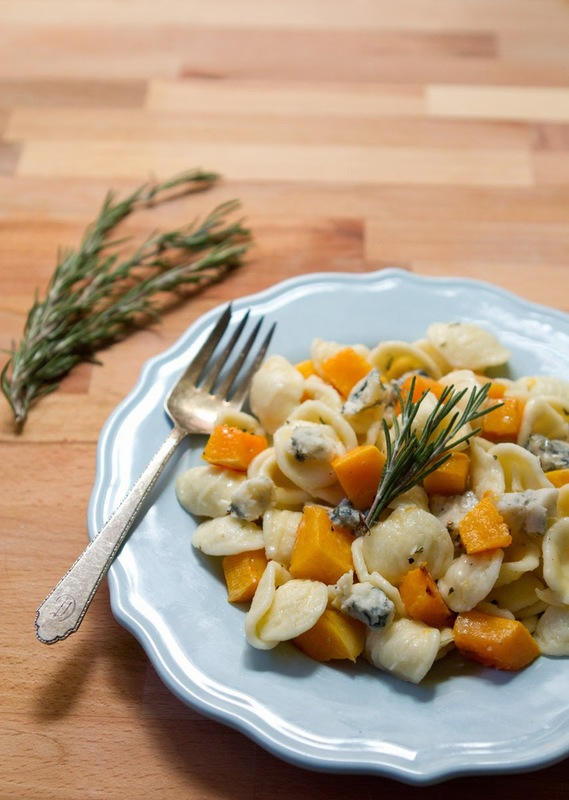 I'm not quite sure what it is about the marriage of butternut squash and blue cheese, but the combination is divine. 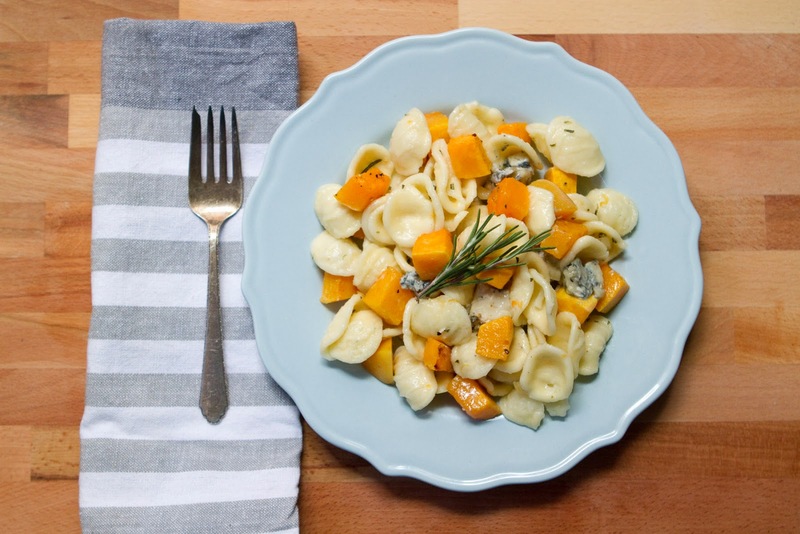 The blue cheese adds just the right amount of cheesy tang and earthy funk to the mild, sweet gourd. 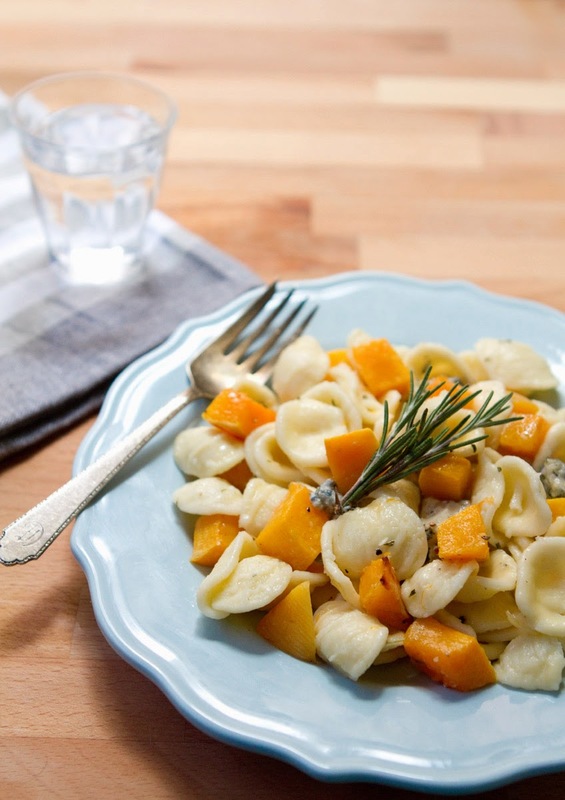 And of course heaping the squash on top of an herb and olive oil covered pasta can only serve to improve the flavor further. There's almost nothing more autumnal than roasted squash. The bright orange color, the earthy-sweet flavor, the caramelized, lightly blackened bits devoured straight out of the roasting pan beside the warm oven. Just looking at these photos makes me want to find a pile of leaves to jump in! Enjoy! Cut the butternut squash in half, and use a spoon to scoop out the stringy, seedy insides and discard them. Peel the squash and cut into cubes a bit smaller than 1" per side. Place squash cubes in a bowl and toss with a pinch of salt and pepper, 1 tablespoon olive oil, and 2 teaspoons finely chopped rosemary. Spread squash in a single layer on a parchment paper lined baking sheet and roast 15-20 minutes, until cooked through but still holding their shape. 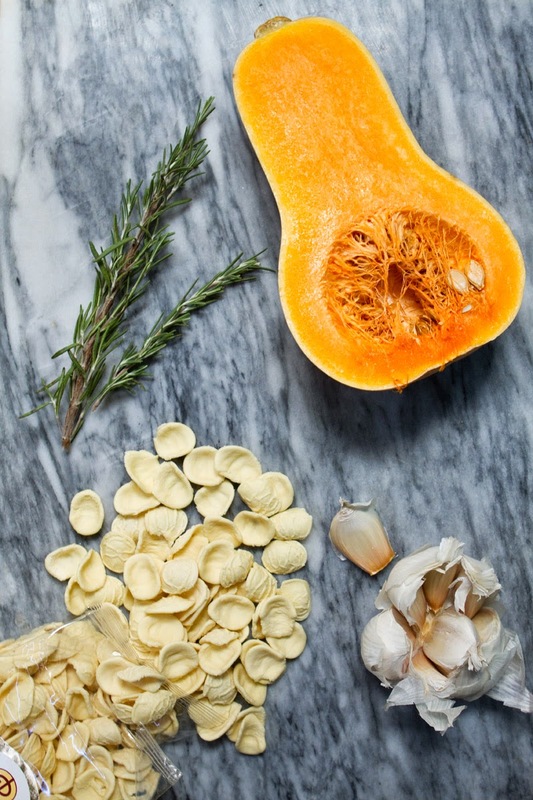 While squash roasts, boil a large pot of water, and add the orecchiette. Cook 8-10 minutes, until al dente. Drain and return to the empty pot. While the pasta boils, mince 3 garlic cloves and 1 heaping tablespoon rosemary, add to a small frying pan with 4 tablespoons of olive oil and cook over low heat until the garlic is soft and fragrant, about 4 minutes. Crumble the blue cheese and set aside. 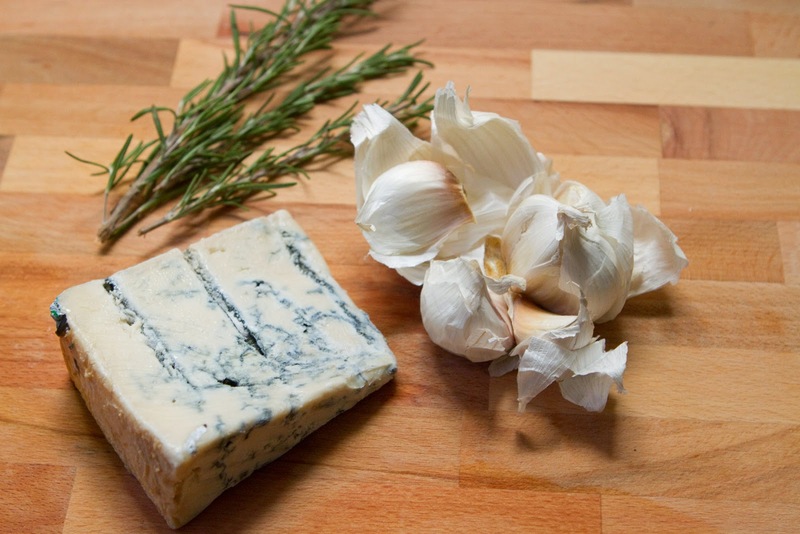 Pour garlic-rosemary infused olive oil over the drained pot of pasta and mix well. 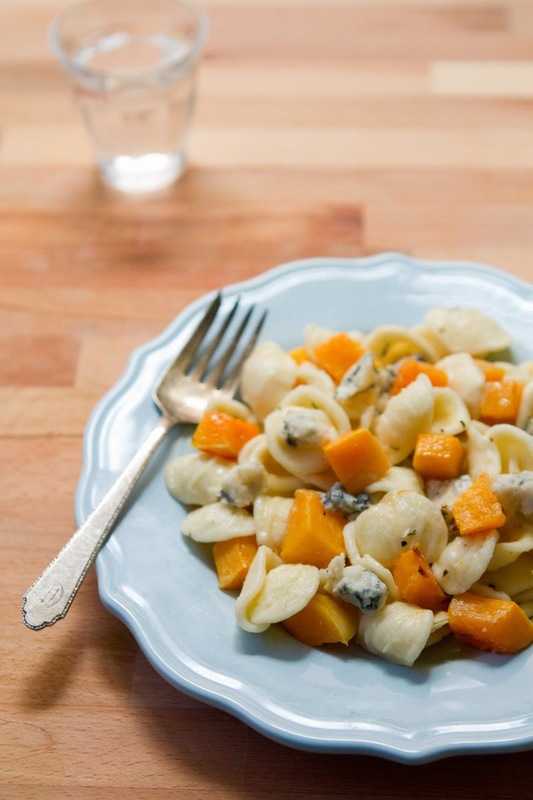 Gently mix in the butternut squash cubes and 1/2 the crumbled blue cheese. Serve topped with additional blue cheese and enjoy!